Veya kitabı 14800 Kobo Super Points ile alın! It may well now be the time to look for new ways of diagnosing, planning, building team cohesion, fostering innovation and implementing changes and strategies. The classic management models have been used and reused, but they have now reached their limits, unable to keep pace with today’s corporate complexity. As more and more is required in the business environment, more is asked of your organization’s personnel. Significant numbers of your employees may be experiencing withdrawal, cynicism and a lack of motivation. Dynamic management routines and sense-making priorities are badly needed in many organizations, as they seek to overcome a crisis of jaded personnel. Now may be the time to look more seriously at workshop management. 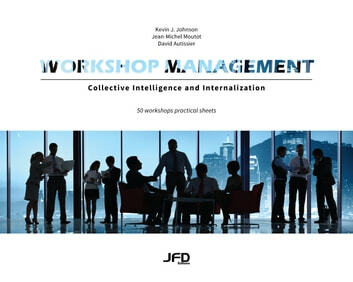 On the one side, this book presents how to achieve organizational performance and efficacy with workshops designed to bring together collective intelligence through analysis, planning, implementation challenges and more. On the other side, this new perspective builds on disruptive approaches and creativity management models. It proposes an integrated framework that allows you to design your own workshop sequence to suit the specific issues and challenges you want to address. The framework is easy to adjust; simply follow the enclosed guide to achieve the desired objectives: planning organizational change, reorganizing a team, fostering cohesion, enabling creativity, developing a vision, reframing a strategy and more. To help you attain your goals, all 50 workshops are explained in detail on technical sheets containing the workshop descriptions, underlying motives, group compositions, activity illustrations and examples, timing and leadership guidelines, expectations and objectives, etc. You can use them as-is or adapt them to your liking. Kevin J. Johnson is a Management professor at HEC Montréal. His experience also includes acting as a consultant for many private and public organizations, and publishing academic research on change management and organizational behaviour. Jean-Michel Moutot is a professor at Audencia Business School. He has 20 years of experience working for large French and international corporations, helping them with strategic transformations. David Autissier is the director of the ESSEC Chair for Change and a professor at IAE Gustave Eiffel, University Paris-Est Creteil. He worked as a change management consultant in large corporations for 20 years. Méthode de conduite du changement - 4e éd. Conduite du changement : concepts-clés - 3e éd.